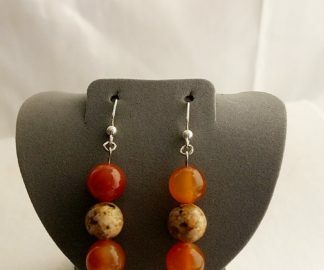 These Red Agate and Jasper Earrings have rich and vivid color. Red Agate and Stone Earrings have rich and vivid color and beautiful and delicate filigree leaves dangling from them. 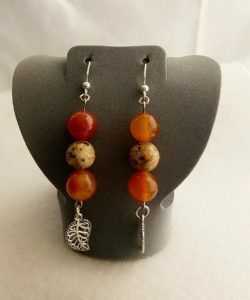 Red Agate and Jasper Earrings have rich and vivid color and beautiful and delicate filigree leaves dangling from them. The beautiful Red Agate and Jasper Earrings are made from Red agate and Picture Jasper, with a delicate Filigree leaf dangling from the end of each one. Picture Jasper- exhibit combinations of patterns (such as banding from flow or depositional patterns (from water or the wind), dendritic or color variations) resulting in what appear to be scenes or images, on a cut section. Diffusion from a center produces a distinctive orbicular appearance. Agate -is a variety of chalcedony formed from layers of quartz which usually show varicolored bands. It usually occurs as rounded nodules or veins. Often tiny quartz crystals form within the stone and add to the beauty and uniqueness of individual stones. These crystals are called druzy (sometimes misspelled as druzy). There are many colors and variants of agate. 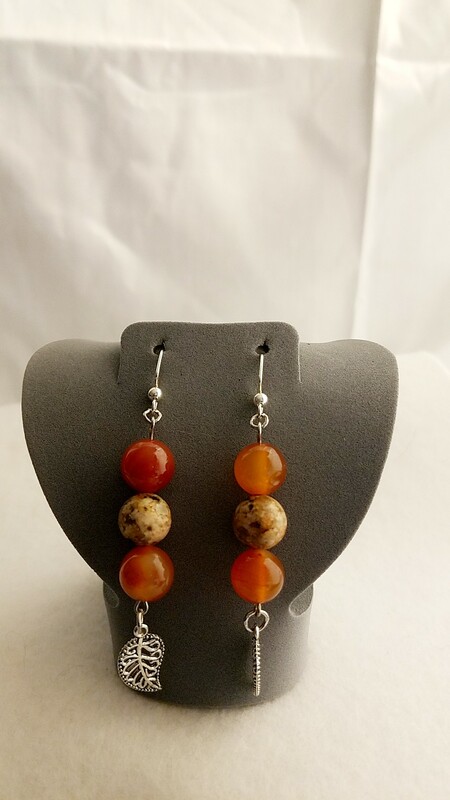 If you would like to know more about the gemstones, rings, and items that are used in making handmade items like this, Red Agate and Jasper Earrings; please take a look at the Material Description Page and my Chain Maille Descriptions page.